The most amazing display of poultry for the Christmas table is to be seen at Boucherie Caverivière inside Menton's market. Meet Yoann, the talented and good-looking proprietor. 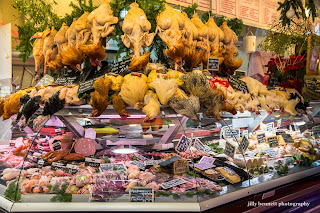 Le plus incroyable des étalages de volailles pour la table de Noël était à voir à la boucherie à l'intérieur du Marché de Menton. Voici Yoann, son beau et talentueux propriétaire. This is country life; I've lived in small towns and big cities and never seen anything like it except in photos. I hope your Christmas was a happy one, Jilly! 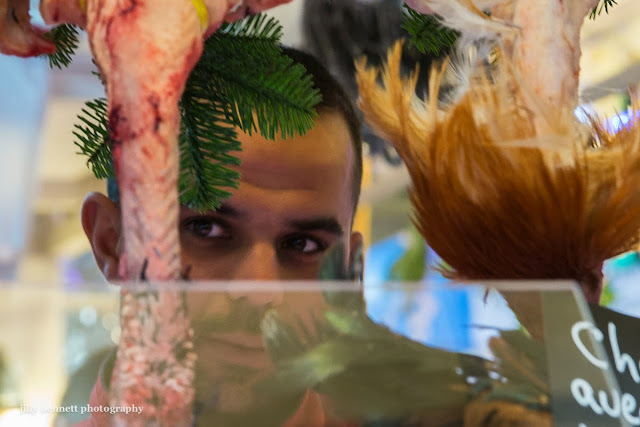 What lies behind those eyes, simple poultry or something deeper? Meat is sterilized in the US. No contact with the animal and none wanted. Stuff from NYC for a few days starting Friday our time at my place. Jilly, you take the prize for most unusual Christmas-time photo! Do they leave the head feathers on to show what kind of bird it is? An Eye for the Girls! Pom Pom Girls for Christmas! The Christmas Party - Dance! The Christmas Party - Cake! Christmas in Menton: Betty Boop!